This is a selection of In’Easa mabu Ishtar's channels transcribed from live recordings during a weekly channel group held over five years from 2004 to 2009. Also see our FREE DOWNLOADS section on the left-hand side column of our home page to download free audio channels - these are regularly updated. Each channel creates an awakening of consciousness and offers an activation of various levels of the energy body through the Ascended Masters that oversouled the group during the channels. The channels are described in the Channel Library Contents Page and are linked to the channels. 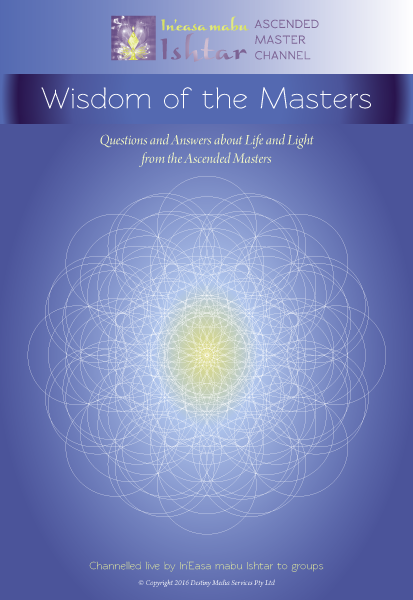 The selection of PDF downloads are gifted freely by In’Easa mabu Ishtar to all beings with the essence of love and unity of the one heart of all that is. As the channels are read and absorbed many Masters, Angels and members of the Family of Light will sit with you and work with you spiritually and energetically. If you allow your heart to open like the lotus flower of life, a delicate and beautiful bloom of divine presence, you will feel your energies rising in vibration and healing of your being will occur. Blessings be and Namaste to all. Lord Kuthumi and Saint Germain clarify what is the path of light and assist us to let go all judgement of ourselves and others. Lord Matreiya honours you and asks you to honour yourself. He offers guidance to connect and anchor your soul energies to flow on your path. Divine Mother takes you on a journey of love and light to assist you to manifest the being you are in the physical dimension. Djwhal Khul assist you to understand what truth is and where it sits within you. He offers an activation to release the mind form facts and figures and to connect with your lotus heart, which holds your divine truth. Lord Buddha shows us that the potholes along our journey are no more than potholes and our path is ever changing and even when you feel stuck upon your path it is moving. Lady Nada explains that money is a tool of the third dimension and not of the other realms and offers wisdom to use this physical tool. She answers questions of abundance in our lives and explains how we are all abundant. Saint Germain offers a discourse and activation to assists us to let go of separation in order to merge as one together and to see ourselves as one with Source. To rejoice and celebrate the code of God that sits within each being. For each one being holds a part of God within them. Lord Khuthumi shares that it is the time now to shine your lights to all and to walk with all hand in hand in the one heart of all that is and it is in the knowing that those beings who you feel least able to hold their hands with are the ones you need most to hold their hands with dear ones. Lady mary shares that when you are aligned with the Christ consciousness energy dear ones of the one heart it will be so much easier for you to flow in life to live within the physical in all things. Lord Melchizedek speaks about seeking and creating the energy of God/Source. He explains we do not need to create it for it already is. God/Source does not need your acceptance or your acknowledgment to exist for it is that which is. And it is for you to connect with this consciously through your being to understand beloved ones that all your seeking, all that you have created to reflect and replicate the creative energy of God that which you are, is for naught, for it is already.